The Crepe Suzette is one of the most famous desserts in the world – but what makes it so special? 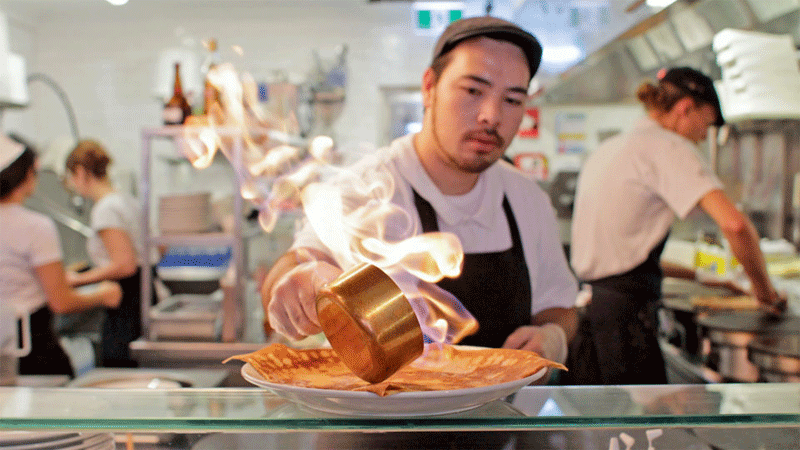 It could be down to the Crepe Suzette’s dramatic presentation, served literally on fire. Or the delicious combination of sugar, butter, zest, tangy orange juice and, of course, Grand Marnier, that makes up the tasty “beurre Suzette” sauce. Whatever the reason for its fame, the Crepe Suzette will undoubtedly always be a favourite among French food connoisseurs and dessert lovers alike. What is the Crepe Suzette? Created in Paris in 1895, the Suzette is somewhat of an old-fashioned dish. How is the Crepe Suzette served? The Crepe Suzette is served flambé. Flambé, which is French for “flamed”, is a cooking technique where chefs add alcohol to a very hot pan, causing a burst of flames. The flames occur from the combustion of alcohol – and when all of the alcohol has been burned off, the flames die down. Because there’s not a lot of alcohol added to the dish, the flames only last a few moments. The effect is magical and very entertaining to watch! Where does the Crepe Suzette come from? A fourteen year-old assistant waiter, Henri Charpentier, created the dish by accident when preparing dessert for the Prince of Wales, the future King Edward VII (1841-1910) of England, and guests including a beautiful French girl named Suzette. According to a similar tale, it was actually a sixteen year-old assistant waitress who created the dish by accident. A chef named Monsieur Joseph supposedly invented the dish for a German actress known as Suzanne “Suzette” Reichenberg. A chef named Jean Reboux created it for for King Louis XV at the bequest of Princess Suzette de Carignan, who was supposedly enamored with the King. Want to try the Four Frogs Creperie version? The Four Frogs chefs have created a more modern version of this French classic, using fresh orange segment, candied orange zest, orange caramel and flambée with Grand Marnier. We offer the Crepe Suzette as a special in addition to our current day-to-day menu, and it’s always the most popular dish on offer when it features. When it’s not on our menu, don’t despair – we always have a variety of flambé crepes on offer as regular menu items at both Four Frogs Creperie Mosman and Four Frogs Creperie Randwick. Browse our crepes menu online, or contact us to book a table.